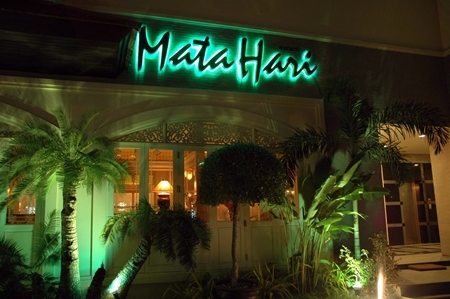 If you have not heard of the Mata Hari restaurant, where have you been for the past 18 years? 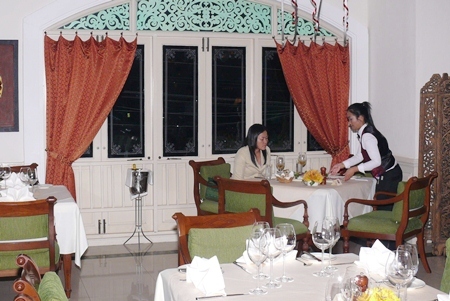 Mata Hari Restaurant and Wine Bar has been one of the foremost restaurants in the Pattaya fine dining scene. Run by Louis Noll and his wife, he will modestly disagree with the ‘fine dining’ appellation, so I will instead call it superb food in a fine dining environment. After some years on Second Road, Mata Hari is now situated on the ground floor of the Nirvana building at the top of Thappraya Road on the left hand side driving towards Jomtien from South Pattaya. It is divided into two sections, with one third of the building a dedicated wine bar, and the other two thirds the restaurant proper. The décor is classic Euro style, with comfortable carver chairs and large tables which are all well spaced, so conversations can remain private. There are marble floors, heavy linen tablecloths and excellent quality napery. The staff are in classical long black aprons and white shirts/blouses and waistcoats, and are friendly, well trained and efficient. The spotless kitchen is against the far wall, and overseeing it all, is the ubiquitous Louis Noll himself. During the last 18 years, the Dining Out team has eaten many times at Mata Hari, and will often drop by for a glass of wine to finish an evening. And each time we will always be welcomed by Louis himself. He is mine host in the traditional manner. On this particular evening we had come to taste some dishes from his updated menu, which reflect the international background of Louis himself, though he does not like the “international” adjective being applied to his creations. “The food is European” said Louis firmly; however, there are many from the Asian. Before looking into the menu and the new items, it is worth your while looking at the wine list. Selected for performance balanced against price, most wines are around the B. 1,000 – 2,000 range, though there are premium wines for those who wish. On a whim, we chose an Argentine white, labeled as a Sauvignon Blanc/Chardonnay from the Finca El Portillo vineyards and good drinking at B. 1,050. It was also served at the correct temperature, a rare event these days. Take your time reading the menu as well, as there are many dishes not readily available elsewhere. From Louis’ new additions there are dishes such as Nasi Goreng and chicken satays and Turkish lamb kebabs. There is also a pork and chicken shawarma and a white asparagus soup or a smoked pork rib with a sauerkraut accompaniment. Soups range in price from B. 210-280, and salads B. 350-410. Dishes marked as entrees come in at B. 390-420, including a trio of smoked fish with salmon, eel and trout. Italian offerings include pasta dishes at B. 350-410, and of course in the mains there are many steaks (including a Canadian one) with these being at the top end at B. 620-890 with your choice of sauces. Despite all the interesting new dishes, for my entrée I chose an all-time favorite in an Oysters Kilpatrick. These were very plump, and were totally enjoyable. This dish was also notable in that there were six oysters and not the more usual five masquerading as half a dozen! I also sampled Louis’ home made pate, and it was excellent. 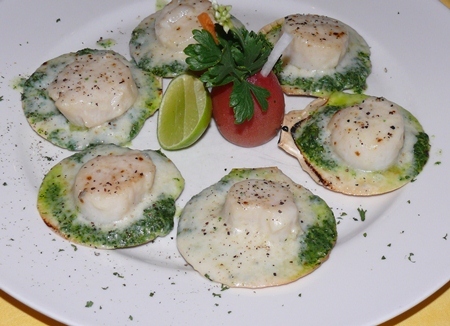 For my main course, I returned to the entrees, and selected the US scallops on a bed of spinach and cheese on the shell. This was a superb dish with plump scallops on a very ‘more-ish’ spinach and cheese base, which even prompted me to ask for a spoon, so I could get every last bit of it! We finished with a liqueur, and for me it was the combination called a “Rusty Nail” made from Drambuie and Scotch whisky, which I sat on and savored while discussing the restaurant business with Louis Noll himself. Mata Hari Restaurant and Wine Bar, 482/57 Thappraya Road (ground floor Nirvana Place), telephone 038 259 799, fax 038 259 798, email louis @mataharirestaurant.com, www.mataharirestaurant .com. Open six days (closed Mondays), Wine Bar from 5 p.m. and restaurant from 6 p.m., secure on-street parking. Book!